Gutter maintenance is something that can be done on your own without having to hire a crew of professionals (provided your home is a typical residential property). And yet it’s safe to assume that gutter cleaning is probably not your number one priority. After all, fall in Chicago can be chilly and who wants to climb up a ladder to get rid of leaves, dirt and grime? Regardless of how you feel about your gutter maintenance, it’s an important chore that shouldn’t be ignored. Allowing precipitation runoff to flow through your gutters freely will prevent water from pooling around your home and damaging the foundation. Trust us, you don’t want that. So how to make cleaning your gutters an easy and quick affair? Below we have compiled some tips, including the most useful, must-have tools for the most serious and responsible homeowners. Ladder safety. First things first. If you decided that it’s absolutely necessary to climb a ladder, follow basic safety procedures and don’t forget to use common sense. A four-legged step ladder is good for a single-story structure, and an extension ladder is ideal for a two-story or taller facility. An orchard ladder is not recommended because there are only three legs for support and they can become unbalanced. A wooden ladder is also not recommended because they are often wobbly and difficult to safely balance. Fiberglass ladders seem to be the sturdiest, but are also the heaviest. If you are cleaning gutters for hours upon hours, muscle fatigue can set in from moving the heavy ladder numerous times. If this is the case, you should try using an aluminum ladder, which is the second-choice option for strength and support. Always inspect the ladder for defects, dents or loose parts before climbing! Garden hose is your friend! Use a garden hose with a pistol-grip trigger spray nozzle. This type of spray nozzle allows you to adjust the water pressure with the use of just one hand. A pistol-grip trigger spray nozzle can be easily hung over the front edge of the gutter while moving the ladder or while using a gutter scoop. This type of spray nozzle can be purchased at any hardware store. Get a gutter scooper. Scooping out the leafy debris seems to be the best overall method for cleaning out gutters. An excellent tool for this job is a plastic scooping tool, which can be purchased at most hardware stores. Don’t forget your roof. Rake or power-wash all debris off the roof first. Otherwise, the next rain will wash all the debris down into the clean gutter, clogging it up again. Also, debris left on the roof can lead to water damming up in valleys, around the chimney or near heating, ventilation and air conditioning (HVAC) equipment, which can cause erosion and roof leaks over time. Below are some really cool tools that will make cleaning your gutters if not more enjoyable at least a lot safer. Now gutter maintenance is easy from the ground, fits on an ordinary extension pole, is light enough to reach a two story gutter, grasps even pine needles, cleans beneath the supports and doesn’t get you or the woodwork wet or blow the mess all over. Please note that the extension pole is not included! Adjust the tongs forward and you can use it to grasp out-of-reach lightweight objects. 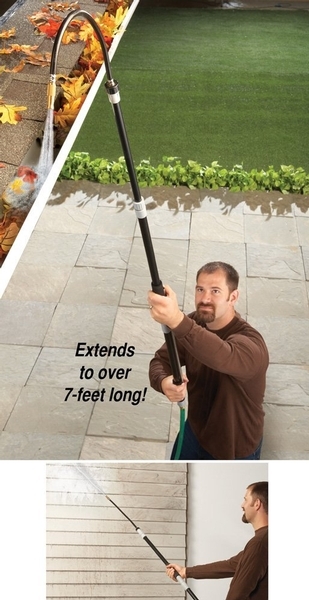 This handy gutter flusher attaches to your standard 5/8" garden hose and extends to over 7-feet long! The flexible end lets you bend it to the perfect angle, and the concentrated spray makes it easy to flush leaves and debris out of your gutters without climbing a ladder. It’s also great for cleaning patios, siding, walkways and more. Extends from 48"L to 86"L.
We love this gutter cleaner because it’s relatively inexpensive, does its job and is non-toxic. Removes black streaks, dirt, mildew stains and more. Concentrated professional strength. Specially formulated to remove tough soils from exterior metal, vinyl, plastic and aluminum surfaces. Safe to use on gutters, window and door frames, siding and lanai frames. No bleach or ammonia; non-toxic water-based formula. Safe for people, pets and plants. Water based.